I grew up in a northwest suburb of Chicago. When I was young, there was a bus that would travel from the center of my small town to a local shopping mall that housed the famous Marshall Field’s & Company. During the summer months, my best friend and I would board the bus and head to the mall. The bus was never crowded and the air conditioned environment was a welcome sensation as we had to ride our bikes to the bus stop in the summer heat. The first stop at this enormous shopping mall was the Marshall Field’s entrance. We would hop off the bus and head to our favorite restaurant destinations housed within the centrally located food court. After lunch, we made our way through all of the “young girl” stores that displayed an array of cheap jewelry, poorly constructed clothing, and inexpensive footwear. As we grew older, we found the bus trip to the mall to be a great way to save on gas money, forget about the hassle of finding a parking spot, and catch up with friends while the bus driver brought us to our desired destination. Marshall Field’s had a cafe style lunch area that became our new, more mature, lunch hangout. I would always order the Chicken Salad. Their recipe included sweet grapes, crunchy nuts, and moist chicken bits, in a smooth creamy dressing. Over the years, I’ve tried to mimic the recipe to the best of my recollection. I’ve seen other copycat recipes that include sour cream and Dijon mustard, but this is the way I like to remember the salad. I often substitute the grapes with pineapple for a more tropical twist… And I sometimes serve the chicken salad in a pineapple boat for a dramatic summer presentation. Every time I assemble this recipe, I think about my carefree summer days riding the bus and enjoying the wonderful memories of Marshall Field’s & Company. Mix first 4 ingredients together in large bowl. Add chicken, onion, celery, pecans, and optional grapes. Mix well. Cover and refrigerate for at least 1 hour. On Sunday afternoons, I often set up my crock pot to cook several pounds of chicken to be used for various meals during the work week. I load up my slow cooker to let the chicken simmer away for 8 hours and then chop or shred the poultry for chicken salad, chicken lasagna, spicy buffalo chicken sandwiches, or to be used as a green salad ingredient. This is a complete time saver when trying to juggle a full work day and a lengthy commute, while working to get a decent meal on the table in a timely manner. I usually serve this Spicy Chicken Roll with a fresh green salad. My children will often take a slice for their lunch bag, to be eaten cold or heated. The mild spicy flavor is a family favorite. Heat oven to 350 degrees. In small saucepan, mix cream cheese, hot sauce, chicken and shredded cheese. Heat on medium-low until combined and cheese has melted. Cool. Unroll both cans of dough; separate into 16 triangles. On cookie sheet, arrange triangles in ring so short sides of triangles form a circle in center. Use a small oven- safe bowl to guide and maintain a circle. Dough will overlap. Dough ring should look like a sun. Spoon cream cheese mixture on the half of each triangle closest to center of ring. Bring each dough triangle up over filling, tucking dough under bottom layer of dough to secure it. Repeat around ring until entire filling is enclosed. Bake 20 to 25 minutes or until dough is golden brown and thoroughly baked. Cool 5 to 10 minutes before slicing into serving sized pieces. Recently, we had an open house graduation party for my oldest daughter. We were expecting 75-100 people and had made arrangements with a Chicago pizzeria to come to our home with a pizza oven to cook made-to-order pizza upon request. We have had this particular pizzeria here several times over the years because everyone raves about the flavor of their pizza and I love that most of the work is done for me when preparing for a party. I usually make a few salads and desserts while the pizza is taken care of by our pizza guy. Well, this year things didn’t go so smoothly. We had told the pizzeria that the party was set to begin at 1:00pm and that we would set up an area with tables for pizza preparation and serving. Well, about one hour before the party, I sensed that something was wrong when no one was here to start the oven and prep for the party. I called the restaurant and got no answer. I called a friend of the owner next, looking for a cell number to talk directly to the owner. After a confusing conversation, we realized that the pizzeria had booked us for the wrong date! I was panicked trying to think about how I would manage serving all of our guests with just the salads and desserts I had prepared. Here it was 25 minutes before the party was to begin and we were without our unique main dish. Well, I spent no time worrying and put myself in damage control mode. I opened my huge freezer and found 6 – 3 lb. bags of frozen chicken breasts. I ripped open the bags and threw the chicken in as many roasting pans as I could find. I instructed my oldest son to turn on the outdoor gas grill at the highest heat possible. I have 3 indoor ovens so I turned them all on and popped the pans of chicken in. While my son grilled the first batch of frozen chicken, I tried to thaw the remaining chicken in the oven. I sent my daughter on a hunt to find any kind of bottled marinade available in the pantry. She found Sweet Baby Ray’s Teriyaki Marinade Sauce. I poured it into a bowl and gave my son a brush to slather it on the barbecued breasts. As he pulled the finished breasts off of the grill. I pulled another batch out of the oven and threw them on the grill to finish cooking. We made a fabulous team and within 25 minutes we had made quite a few breasts that were ready for initial serving. I sliced each of the breasts in bite sized pieces to fit on bakery rolls that we had purchased to go with the salads. All the while, my husband was manning the beverage area, greeting guests and refilling drinks. My sister jumped in the car with her husband heading to the local grocery store to fill the shopping cart with an assortment of foods suitable for the buffet. You can ‘t imagine how quickly we worked together. And oh how surprised and delighted we were when our guests praised our efforts and raved about the great tasting flavor of the chicken. After all of the guests said their good-byes and I had a chance to catch my breath, I was thankful for the help of family and friends, good company, and relieved that it was all over. Things have a way of working out. When the going gets tough…family and friends pull together and help each other out. …Can’t wait till next year as we will do it all over again when our twins graduate! Preheat barbecue on high heat and carefully oil barbecue rack. 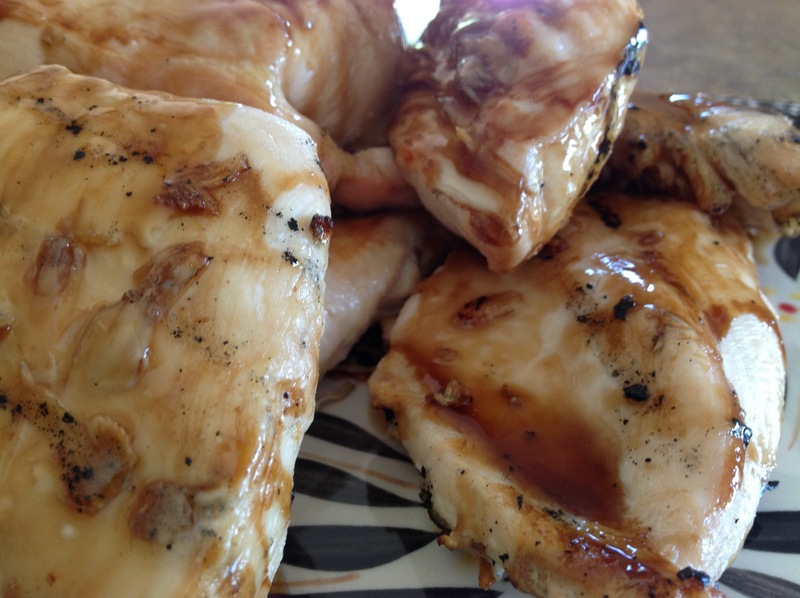 Lower the temperature to a medium- low setting and place thawed chicken breasts on the grill. Continue to grill flipping breasts to cook evenly. When meat has reached desired internal temperature, remove from grill and slather with marinade to coat completely. When I was in college, my roommate invited me to her hometown to spend the weekend with her family. My roommate’s mother was a wonderful cook, she prepared all kinds of goodies for us to munch on during out weekend visit. On Sunday afternoon, just before heading back to our college dorm, J’s mom prepared these delicious chicken strips with oven baked fries and a fresh garden salad. I thought the chicken was absolutely delicious. The meat was super tender, while the crust was flavorful and crunchy. Years later, after I had graduated and was ready to start a family of my own, I asked J’s mom for this recipe. 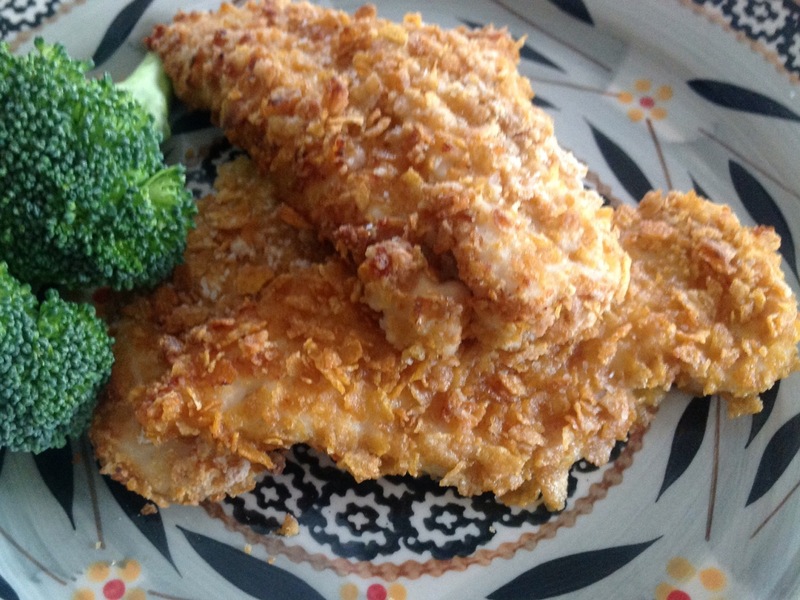 Oh, it’s so easy to make these strips…the oven baking eliminates the greasy mess that fried chicken leaves behind. Yet, these delectable strips are crispy and delicious. Once you try them, this might be the only way you prepare chicken for your family. Preheat oven to 400 degrees. Spray a 15×11″ baking pan with non- stick cooking spray. In three separate mixing bowls, individually place the flour, butter, and corn flakes. Dip the chicken strips in the flour, then the butter, then the corn flake cereal. Place the coated chicken strips on a baking sheet. Bake 20 – 25 minutes, until chicken is no longer pink. Serve with ketchup, BBQ sauce, or ranch dressing. We are not a family that often eats out. I’d much rather make “copy-cat” restaurant favorites at home. Then, I can tailor the recipe to please the whole family ( for far less money). However, there are times when we are out and about and find ourselves in need of a meal. A couple of years ago, we went to a new restaurant for a birthday celebration. My daughter ordered a salad that looked quite interesting. She was attracted to the notion that the salad included a few of her favorite foods…noodles, romaine lettuce, and Parmesan cheese. She was quite pleased with her choice and was not disappointed with her meal. As I looked at the salad, I realized that we were paying $9 or so for a Caesar salad with noodles in it. Shortly thereafter, I duplicated the salad in my kitchen and it has since become the only way I prepare Caesar salad for my family. Adding grilled chicken makes this tasty main-dish salad a hearty meal. 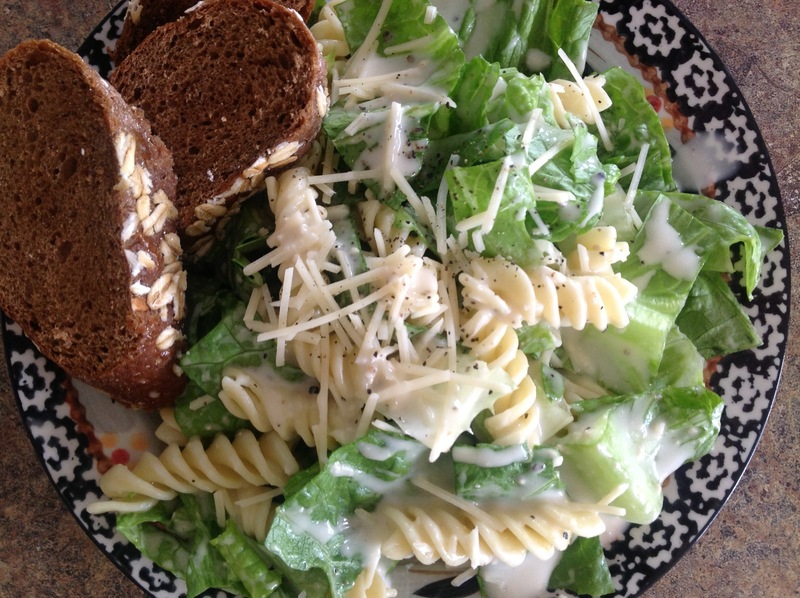 In a large serving bowl, mix romaine lettuce with fully cooked and cooled noodles. 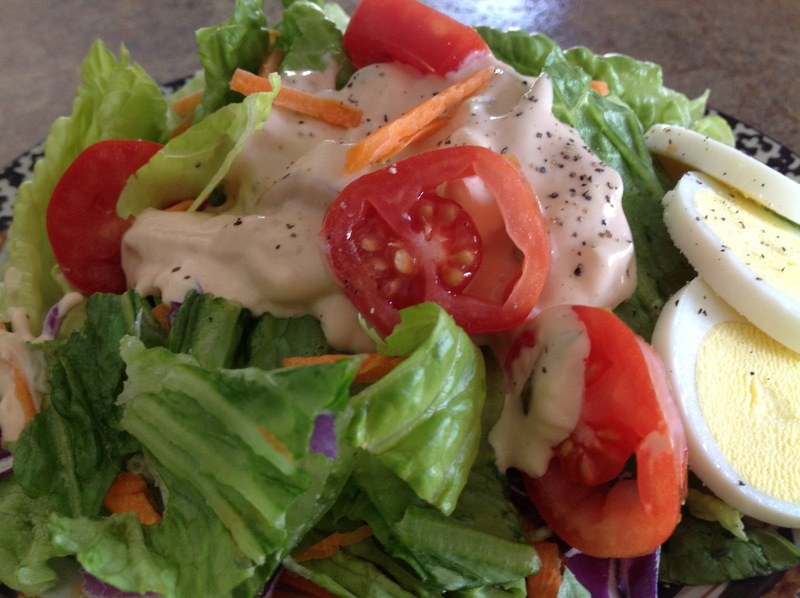 In a smaller bowl, mix 1 cup of dressing with 1/2 cup water to dilute the dressing, mix to combine. Pour dressing mixture over the lettuce and noodles. Toss to coat all of the ingredients. Sprinkle Parmesan cheese over the salad and gently toss. Add croutons and pepper to taste. Serve immediately. Spring has finally arrived and it’s time to pull out all of the delicious salad recipes that have been tucked away all winter long. 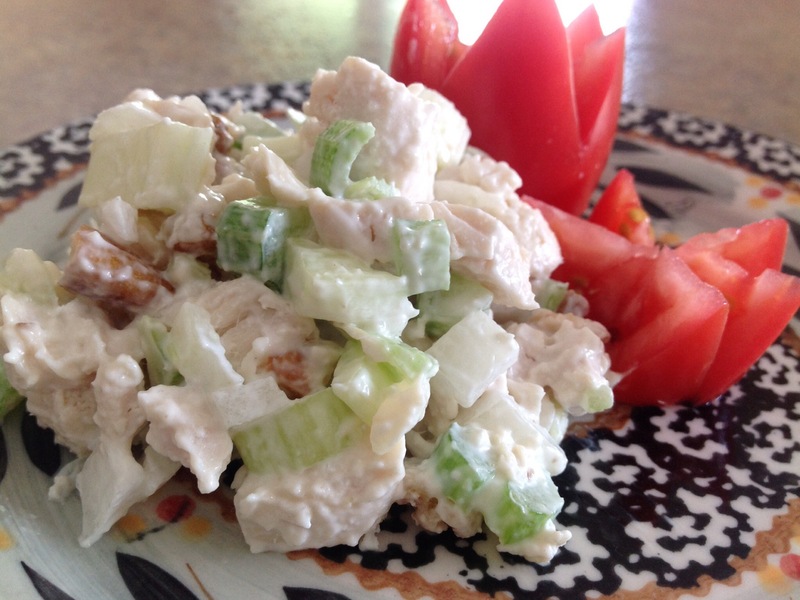 Today’s recipe is packed with lots of A,C, and B vitamins, calcium, fiber, and protein. Broccoli is known as a “super food” because it is rich in so many vitamins and minerals and has a bushel full of health benefits. Packaged slaw makes this salad a snap to mix together. If you’re so inclined, throw in a handful of raisins for a burst of flavor and added texture. This is a very affordable and clever way to get your kids to eat their veggies! Mix the sugar, oil, and vinegar in a large bowl. 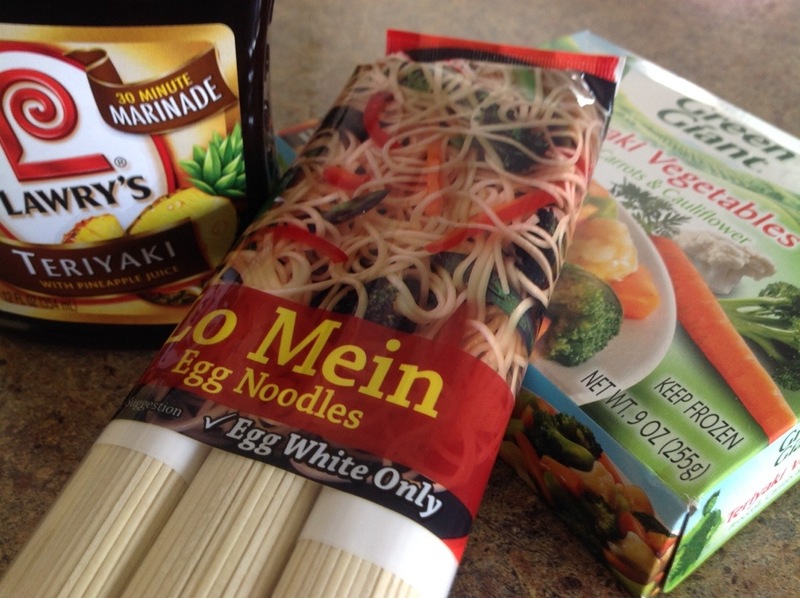 Add seasoning packet from ramen noodles; mix thoroughly. 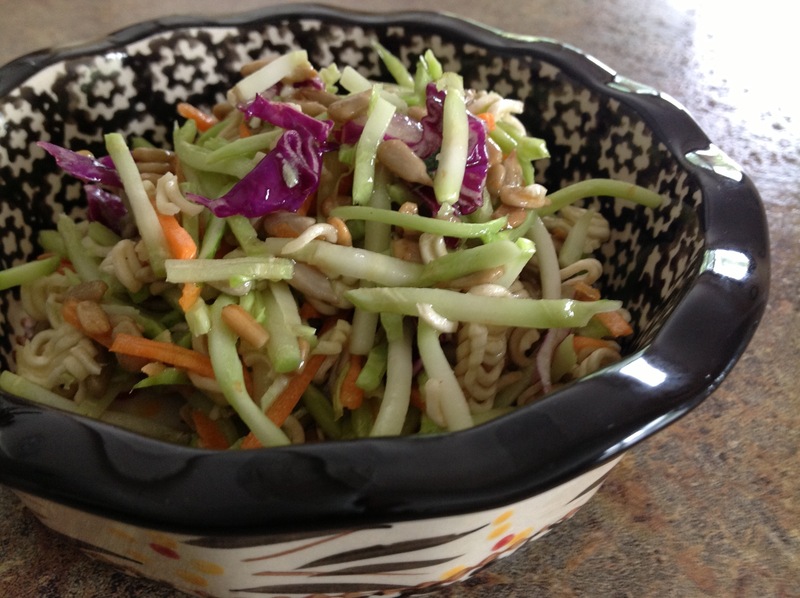 Pour broccoli slaw, noodles, seeds (optional peanuts) into the dressing mixture and toss to completely coat all salad ingredients. Chill until ready to serve. Our daughter is beginning her clinical year up in Evanston, IL. Once again, we loaded up all of her belongings to move her into a cute little apartment, not far from the “Purple Line” in a beautiful part of town, just outside the Northwestern University campus. The cool breezes off the shores of Lake Michigan have made for an unseasonably cooler summer. After settling her into the apartment, we walked into town to find a local place to eat lunch. We spotted an adorable restaurant called The Farmhouse-Evanston. The menu touted local foods, brews, and seasonal fare. With a chill in the air, the tomato soup and grilled cheese sandwich sounded wonderful. My daughter ordered it without hesitation. All through the meal, she raved about the creamy soup and hearty, three-cheese sandwich. After returning home, I was inspired to make a big pot of flavorful tomato soup for the family. What a treat. This recipe makes enough to serve the whole clan with extras to pack into containers for weekday lunches. …Outstanding soup! Don’t forget to garnish with pieces of garlic toast, Parmesan cheese, and fresh basil. In a medium pot, heat olive oil over medium-high heat. Add garlic and saute for 30 seconds, don’t over cook. Add onion; stir and cook until translucent. Add the two can of tomatoes with juice, chicken base, water, and sugar. Bring to a low simmer. Cook uncovered, for 12-15 minutes. Add the half & half, basil, Italian seasonings, salt and pepper. Using an immersion blender, puree soup until smooth. Serve immediately with a hearty grilled cheese sandwich or a fresh salad. For years, we’ve been visiting Disney’s Polynesian Resort and O’Hana’s Restaurant for their well attended dinner show. This family-friendly dinner event includes generous helpings of Polynesian inspired delicacies with a bit of entertainment provided by a ukulele playing woman (or gentleman) dressed in island themed clothing and singing (Disney-style) Polynesian tunes. All the while, the friendly waitstaff scurries around the dining tables offering guests various grilled meats, sweet bread and family-style fixings. Children are invited to come to the center of the dining room floor to play games and celebrate special occasions. It’s a festive evening and we always look forward to our annual visit. The sweet and savory aroma that fills the dining hall just can’t be beat as Ohana’s food is absolutely fabulous. Pot stickers, Hawaiian sweet bread, a scrumptious salad, chicken wings, bread pudding and a variety of grilled meats are delivered to the table with gusto and are unlimited. 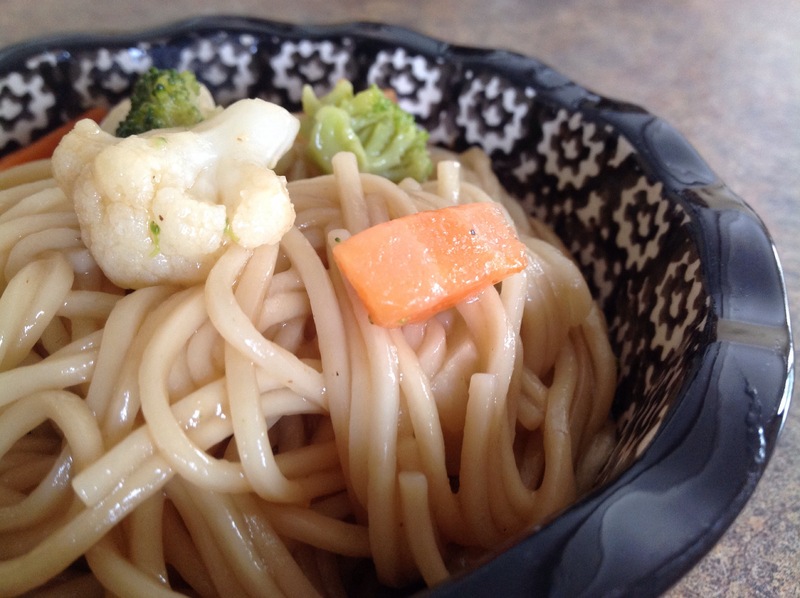 One of our favorite dishes is prepared with low mein noodles, pineapple teriyaki sauce and veggies. I’ve tried to duplicate the flavor of this dish at home and in a simplistic way. This recipe is a close second to the original and eating it brings back fond memories of our time spent at Disney over the years. We look forward to celebrating our vacation with the staff at Ohana’s for years to come. In a medium saucepan, prepare noodles according to package directions. Drain and return to saucepan. Microwave vegetables according to package directions. Mix in remaining ingredients and heat thoroughly. Serve piping hot. When we lived in Chicago, there was a local neighborhood restaurant that served the most delicious salad with greens, cucumbers, chicken breast, croutons and thousand island dressing. Every Sunday we would treat ourselves to their delightful salad along with one of their tasty pizzas. When I tried to duplicate the salad at home, bottled thousand island dressing just didn’t make the grade. In those days, the Internet was not as extensive as it is now so I scoured my collection of cookbooks for a basic dressing recipe. My old Betty Crocker Cookbook (fifth printing,1988) had the perfect recipe because I had all of the ingredients on hand and could make the dressing with little effort. While I have altered the original recipe a bit, this Old Fashioned Thousand Island Dressing recipe has become a favorite in my house. Mix all ingredients; cover and refrigerate before serving.